Despite my love of dining out, I often cook at home. Not only do I enjoy cooking, sometimes it's the only way to get some authentic dishes from home (like American pork lo mein, Mexican fajitas and tacos, New Orleans gumbo, and Texas chili) and some dishes that you can never find in a restaurant (like my mom's spaghetti). Lately I've been making an effort to try more Japanese dishes like the ones we ate on our trip to Japan. I've found a great Japanese-American blogger from the San Francisco bay area who writes on Just One Cookbook. So far, I've made tsukemen, soba noodles, and ochazuke, and I recently tried katsu curry (see some pictures at the end of this post). These recipes often require ingredients that can't be found in my neighborhood grocery store. The Edeka where I shop does have a small Asian aisle, but most products are from the standard Bamboo Garden brand (although Edeka recently started stocking panko breadcrumbs and miso paste -- I was impressed!). When I need more exotic ingredients, like real ramen noodles, soba noodles, chili bean paste, dried bonito flakes, mentsuyu (a soup base), and narutomaki (a kind of fish paste), then I head to the Asian market. The Asian market where I shop is conveniently located downtown in the Rathaus u-bahn station. There's a very small shopping area in the passageway between the Bohnenviertal side and the Marktplatz side beneath Hauptstätter Straße. There you'll find a lovely flower shop, a shoe repair place, a vegetable and fruit vendor, and the Trieu Asian Shop. Tip: When you come out of the Rathaus passageway on the Bohnenviertel side, be sure to check out Richie's. This tiny boutique sells all sorts of beautiful costume jewelry, cards, and kitschy gifts. It's one of my favorite stores in Stuttgart. Outside of the Asian market they have a huge display of instant noodles, rice crackers, and snacks, like dried mango and plantain chips. Inside they have a couple of freezers where you can get dim sum and hard-to-find foods in Germany, like soft shell crabs. 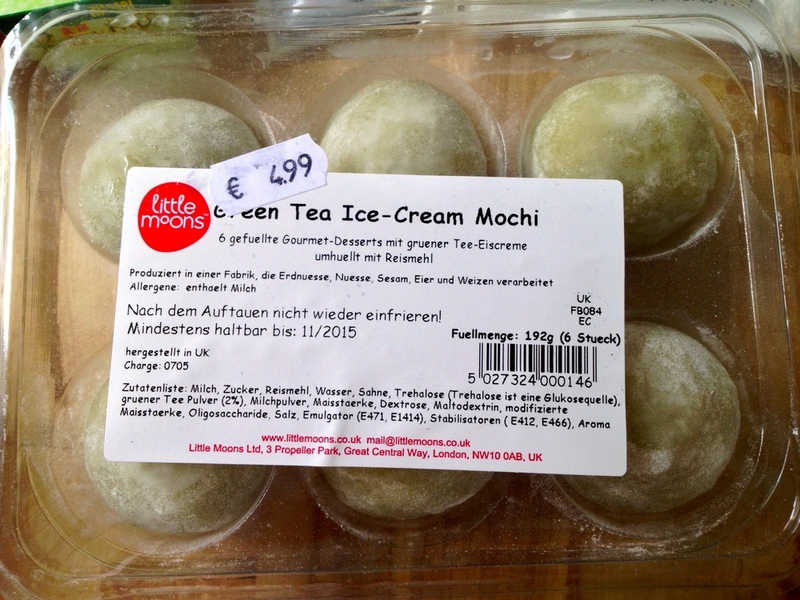 I was also delighted one day to find mochi filled with green tea ice cream -- yum! 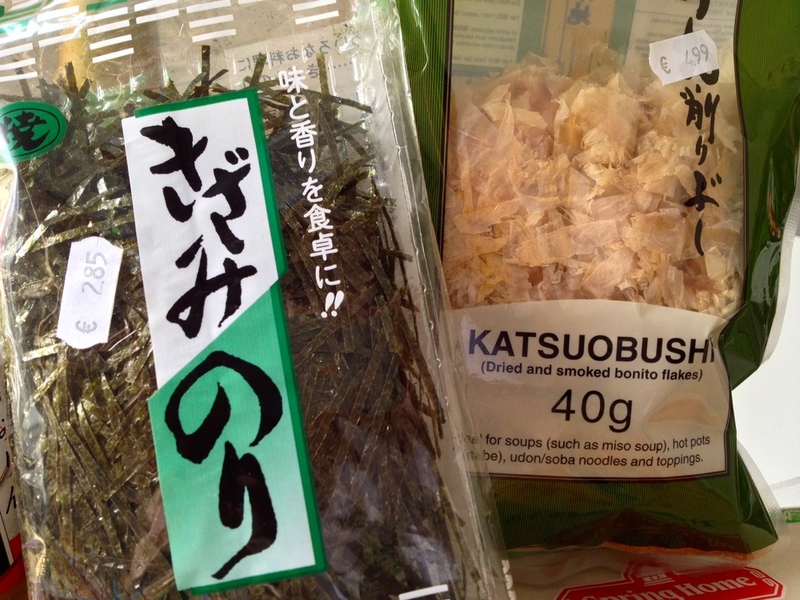 In the center aisle, they have a huge display with Japanese specialities, like miso paste, nori, and Golden Curry. They even have a drink section with Asian beers and lychee juice. Along the back wall, you can also find a few Asian dishes, like bowls and spoons, teas and matcha powder, and other Indian, Korean, Thai, and Chinese sauces and spices. At the front is a refrigerator with everything from fresh bok choy, lemongrass, and cilantro to fresh tofu. I haven't had the chance to the tofu yet, but I have been impressed by their homemade bánh boa (Vietnamese pork buns) that they sell at the counter for just 2€ a piece. I don't think I've ever gone looking for something that they don't have, and the young woman who works there is extremely friendly and very helpful. Once when Matt and I were shopping for a tsukemen recipe, I was looking for narutomaki (a kind of fish paste). I wasn't entirely sure what it was since I'd never had it before and I thought it would be a long shot for this tiny little Asian market in Stuttgart to have something that to me seemed very specific. Matt asked the woman but she didn't know it by name, so I found a picture to show her. She thought for a moment, and then turned to one of the freezers where she dug out a perfect package of narutomaki. I've heard of a couple of other Asian markets in the area, but right now this one at the Rathaus is close to home and has everything that I've needed so far. Have you been to one of the other Asian markets in the Stuttgart area? If you can recommend one, then let me know in the comments below. I'll check it out and compare it in another post!